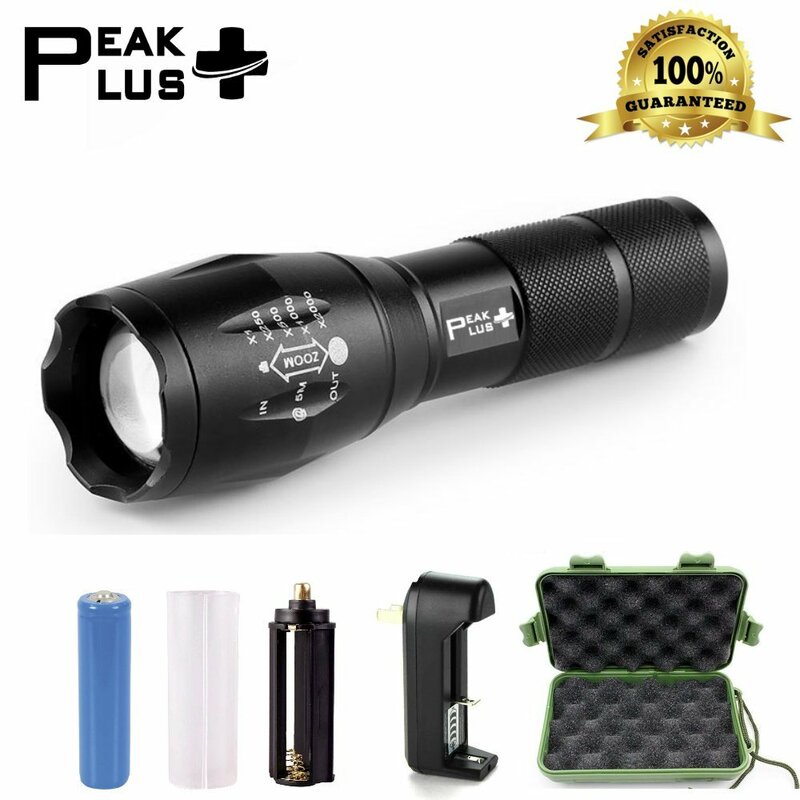 Home › Best-Sellers › #1 Top Rated Peakplus Brightest Led Tactical Flashlight Cree Xml T6-Zoomable ..
#1 Top Rated Peakplus Brightest Led Tactical Flashlight Cree Xml T6-Zoomable .. Brightest, High Power Handheld Tactical LED Flashlight/Torchlight - Value-for-money, high quality Ultra Bright LED Tactical Flashlight with high intensity brightness and range. This is the best flashlight for outdoor activities, tactical use, emergency, search missions, routine patrolling, camping, hiking, fishing, cycling, cave exploring, standard household use and self-defense. Full kit comes complete with a green box case. It is an ideal gift suitablefor outdoor use. Key Features: High Quality CREE XML T6 LED lens and chip with a maximum output of 1000Lumens (used with 18650 battery) Lamp body is made of aluminum alloy to withstand abrasion and shock.Suitable for outdoor activities Zoom function allows for adjustable focus Soft-touch Tail Cap Switch allows for on/off mode and switching between 5light modes Specification: LED Type: CREE XM-L T6 LED Lamp Lifespan: 100,000 Hours Brightness: 1000 Lumens Flashlight Body Material: Aluminum Alloy Range: 200 to 500 meters Zoom: x1, x250, x500, x1000, x2000 Flashlight Dimensions (Approx): 5.3"(L) x 1.6" (Head) x 1.1" (Body) (6.10"Full Extended length) Brightness Dimming Modes: Full Brightness, Medium Brightness, LowBrightness, Strobe Brightness, SOS Battery Type: 1 x 18650 3.7v Battery (included) OR 3 x AAA Batteries (notincluded) Charging Time: 6 Hours (Approx) Rated Output: 10W Full Kit Includes: 1 x Ultra Bright, Zoomable, Adjustable Focus CREE XML T6 Tactical LEDFlashlight 1 x AAA Battery Holder (when using AAA batteries, AAA batteries notincluded) 1 x 18650 Plastic Battery Sleeve (when using 18650 battery) 1 x Cordless Lithium Battery Charger 1 x Rechargeable Battery (18650 3.7V 2200mAh Lithium Ion battery) 1 x Green Box Case Do you have a question about our product? Please feel free to ask yourquestion below.